Metropolitan VLADIMIR (Niolae Cantarean) was bor on 18 August 1952 in the village of Colencauti, Hotin raion, Cernauti region, Ukraine. In 1969, he left secondary school in his native village and entered technical-vocational school, graduating it in 1970. Between 1970 and 1973 he performed regular military service at Black See Navy. After entering the reserve forces he performed the function of subdeacon at Dormition of the Most Holy Mother of God Cathedral in Smolensk, holding at the same time the position of clerk secretary at Diocesan Directorate of Smolensk. At 22 May 1974, on the feast of Translation of the Relics of St. Nicholas the Wonderworker, Archbishop of Likian Myra, he was ordained deacon at Smolensk Cathedral of Dormition of the Most Holy Mother of God, by Bishop of Smolensk and Vyazma THEODOSI (Protiuk), as celibate (unmarried), being left for service in the Cathedral. On 22 May 1976, he was ordained priest by the same Bishop, and assigned as depute rector at Smolensk Cathedral of Dormition of the Most Holy Mother of God. In 1981 he was transferred to Diocese of Cernauti, and ordained clergy at St. Nicholas Cathedral of Cernauti by Bishop of Cernauti and Bucovina VARLAAM (Iliusenko). In 1983, being assigned as secretary of Diocesan Directorate of Cernauti, he was ordained to the dignity of archpriest. On 29 November 1987, he took monastic vows with the name VLADIMIR, in the honour of Holy Equal-to-the-Apostles Great Prince Vladimir (feast 28 July), to the newly consecrated Bishop of Cernauti and Bucovina ANTONIE (Moskalenko). In 1988, for the Feast of Nativity of our Saviour, he was decorated with gold cross and ordained to the dignity of hegumen, and decorated with epigonation (palitsa). On Holy Easter of 1988, he was decorated with jewelled cross and ordained into the dignity of archimandrite. On the occasion of Millenary of Baptization of Russia, he was decorated, in the same year, with the right to wear the second jewelled cross. In 1981 he graduated Moscow Theological Seminary, and in 1989 – Moscow Theological Academy. 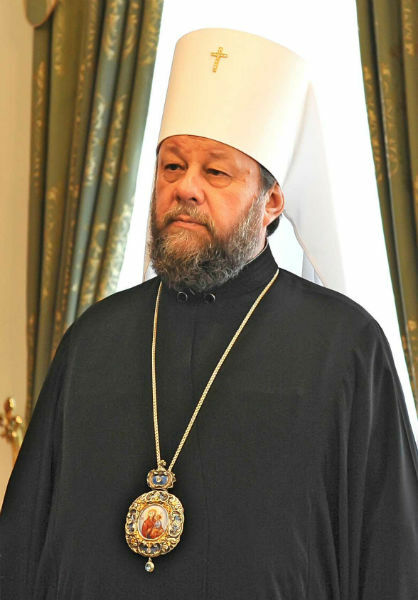 By decision of His Holiness Patriarch of Moscow and All Russia, PIMEN (Izvenkov), and of Holy Synod of Russian Orthodox Church of 07 July 1989, archimandrite VLADIMIR (Cantarean), secretary of Cernauti Diocesan Directorate, was elected bishop of Chisinau and Moldova. On 21 June 1989, on the feast of Kazan Icon of the Most Holy Mother of God, the consecration service was officiated in Patriarchal Cathedral “Baptization of Our Lord”, by bishops who previously elected and publicly announced archimandrite VLADIMIR’s consecration as bishop of Chisinau and Moldova. On the Feast of Holy Easter in 1990, Patriarch of Moscow and all Russia PIMEN raised bishop VLADIMIR to the dignity of archbishop. Since 1990 – member of Synod Biblical Commission. In 1992 Patriarch of Moscow and All Russia ALEXIS (Ridiger) raised archbishop VLADIMIR to the dignity of Metropolitan of Chisinau and All Moldova. Since 1995 – rector at Chisinau Theological Seminary. Since 1997, by the Decree of the Holy Synod of Russian Orthodox Church was named rector of Chisinau Theological Academy and Seminary. In 1990, 1992, 1996, and 1999 was suppliant member of Holy Synod of Russian Orthodox Church. At the Universal Synod of Bishops, held on 13-19 August 2000 in Moscow, Metropolitan VLADIMIR was elected permanent member of Holy Synod of the Russian Orthodox Church. For several times, within official delegations, His Eminence visited the Holy Country, the Holy Mont Athos, and other holy places of world Christianity. Visited numerous Autocephalous and Autonomous Orthodox Churches, and Orthodox Church Dioceses in the Czech Republic, Cyprus, Egypt, France, Greece, Israel, Italy, Japan, Great Britain, Poland, Portugal, Romania, Syria, Spain, USA, Sweden.